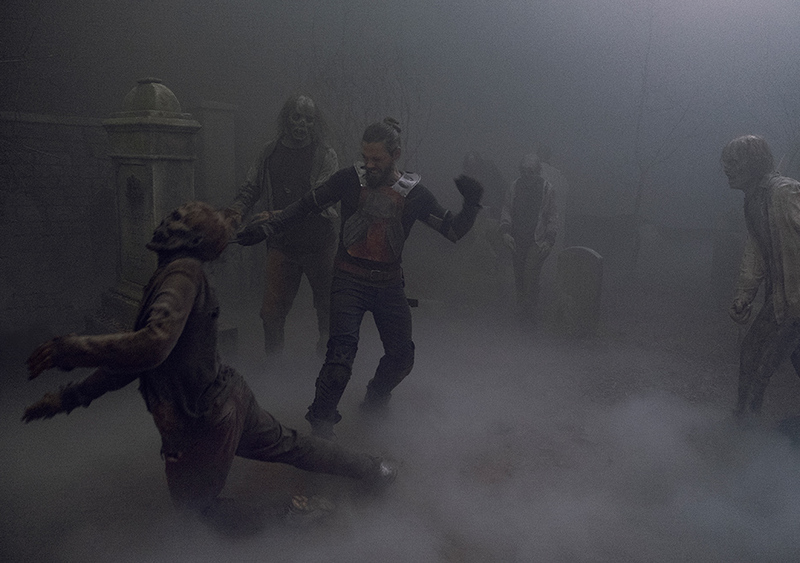 Paul "Jesus" Monroe (Tom Payne) makes some moves before the Whisperers introduce themselves in The Walking Dead Season 9 Mid Season Finale. Season 9 really has been a whirlwind, storywise. The first six episodes were Rick-centric. Little did the audience know, Andrew Lincoln’s last few episodes (which really did stretch the storyline too thin) were also the final ones for Lauren Cohan’s Maggie Rhee, who has left the series to star in Whiskey Cavalier, a new show airing on ABC. There’s been hints that Maggie’s character will possibly return at a still-unresolved future date. Speaking of missing characters, it was also rumored that Heath would make a return appearance this year. Wonder if that’s still possible, now that Corey Hawkins is no longer starring on 24: Legacy. Back to the Whisperers. In “Evolution,” the mid season finale, the survivors realize these undead roamers are not actually evolving, but they’re humans wearing walker skin masks. Basically, they’re the serial killer/slashers of The Walking Dead Universe. Also, the best episode of the season (and maybe the past few seasons) just happened to be directed by a former star of the show: Michael Cudlitz (Eugene). The new, cohesive storyline that’s actually really enjoyable, “Stradivarius” may have the main characters split up, but mysterious events are reuniting them and it’s a great episode. Fences need to be mended among these survivors (but they aren’t, naturally). There’s some mysterious beef between Michonne and just about everybody at Hilltop (including Carol, who just happens to be there). The walkers get a new name (“sickos”), Eugene now has a monster mullet, Father Gabriel has got a new love (Rosita), Michonne is wary of newcomers, Negan teaches a life lesson to Judith, six years of a time jump means that Judith is much bigger now and apparently Michonne had a baby boy with Rick (introducing RJ!). Once again, there’s too many babies and kids on the show… but I guess that’ll never change. When one of them does something dumb (and usually life threatening), it’s to no one’s surprise. Since Rick’s “death,” Maggie’s been missing, so Jesus has become the reluctant ruler of Hilltop, Daryl’s been camping in the woods (with a dog! ), looking for Rick’s body, Hilltop is prosperous, Alexandria has been rebuilt, and so has the Kingdom, but they’ve secluded themselves, walled off from the outside world. Seems like this is the first time these groups have spoken in a while, which means it’s a tough time for Jesus to show off while guarding an injured Eugene, not making out of a spooky cemetery alive. Having already lost her sister, her father and her husband, Maggie has had to really toughen up these last couple of years. Not quite an original cast member, Cohan arrived on Season 2 and eventually became expendable within the All Out War, when Rick refused to kill Negan. Whoever bet that Negan would outlive Rick and Carl, and that Maggie would be gone (at least temporarily), while Negan remained would have made a TON of money two years ago. The series feels somewhat rejuvenated. If only some more big-named stars were killed off, it would really feel like something new. Fans of the comics may know who’s next. Here’s to hoping for an eventful rest of the season. TWD returns on Sunday, February 10th.